Dallas Cowboys / Inaugural Game Cowboys Stadium Framed and Matted NFL Panoramic Photograph. This officially licensed NFL panorama photo is of the Dallas Cowboys (Inaugural Game) at Cowboys Stadium in Arlington, Texas, on September 21, 2009. The Dallas Cowboys played the New York Giants. The deluxe panorama features black double matting and your choice of black or cherry frame, with a 1" x 4" engraved brass nameplate. Actual size is 40" x 14"
Dallas Cowboys / Inaugural Game Cowboys Stadium Framed NFL Panoramic Photograph. This officially licensed NFL panorama photo is of the Dallas Cowboys (Inaugural Game) at Cowboys Stadium in Arlington, Texas, on September 21, 2009. The Dallas Cowboys played the New York Giants. The standard panorama features your choice of black or cherry wood frame. Actual size is 40" x 14"
Dallas Cowboys / Texas Stadium Framed and Matted NFL Panoramic Photograph. This officially licensed NFL panorama photo is of the Dallas Cowboys (20 Yard Line) at Texas Stadium in Irving, Texas on November 19, 2006. The Dallas Cowboys defeated the Indianapolis Colts 21-14. The deluxe panorama features black double matting and your choice of black or cherry frame, with a 1" x 4" engraved brass nameplate. Actual size is 40" x 14"
Dallas Cowboys / Texas Stadium Framed NFL Panoramic Photograph. This officially licensed NFL panorama photo is of the Dallas Cowboys (20 Yard Line) at Texas Stadium in Irving, Texas on November 19, 2006. The Dallas Cowboys defeated the Indianapolis Colts 21-14. The standard panorama features your choice of black or cherry wood frame. Actual size is 40" x 14"
Jason Witten #82 Dallas Cowboys NFL framed and matted 8x10 photograph, with a team medallion and an actual piece of game-used football from a Dallas Cowboys game. The photograph and football are officially licensed by the NFL. Includes a certificate of authenticity and each photograph is hand numbered. 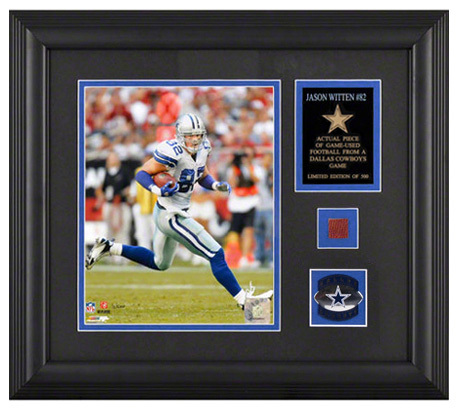 Actual size is 17" x 15"
Jason Witten's name on the plaque will be gold, not blue as shown in the picture. 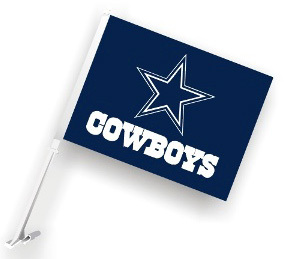 Officially licensed property of the Dallas Cowboys NFL sign, made of durable styrene with die cut hanging hole. These signs work great for indoor or outside use, are nearly indestructible in normal use, and can be washed with soap and water. Made in USA. Measures 7.25" x 12"
Officially licensed Dallas Cowboys 17.5" x 5.25" NFL sign made of durable plastic with die cut hanging holes. The Dallas Cowboys Zone Sign is a great decorator piece, works great outside or indoors, perfect to hang on doors. Made in USA. Officially licensed NFL antenna pennant. The patented antenna pennant is a durable two sided 3" x 9" pennant that is secured to an innovative dual plastic cylinder for attaching to the antenna. Simply slide the two cylinders on the antenna shaft. Surprisingly quiet even at highway speeds. 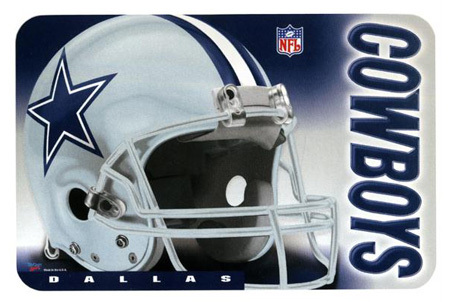 Dallas Cowboys - NFL 3" x 3" Static Cling, by WinCraft. 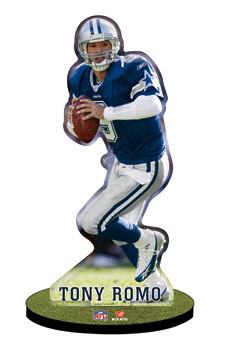 Officially licensed Dallas Cowboys NFL 3" x 3" color static cling. This clear static cling is for use on glass or any smooth surface. Static clings won't damage surfaces or leave a residue when removed. Made in USA. Dallas Cowboys - NFL Helmet Diecut Ultra Decal, by WinCraft. 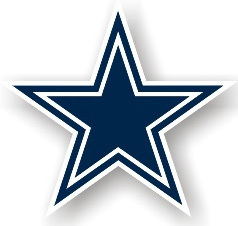 Officially licensed Dallas Cowboys NFL 5.75" x 4.5" color diecut ultra decal. This decal is cut to the outside dimensions of the Dallas Cowboys helmet. These versatile clings can be used indoors or outdoors and will not leave a residue when removed. Made in USA. 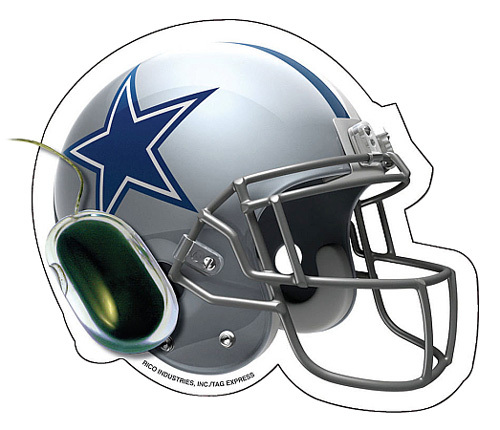 Dallas Cowboys - NFL Helmet Diecut Magnet, by WinCraft. 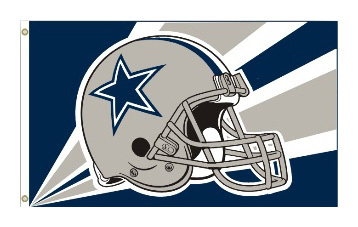 Officially licensed Dallas Cowboys NFL 5" x 4" color diecut magnet made of weather resistant materials. The magnet is great for the back bumper, refrigerator or tool box. Made in the USA. 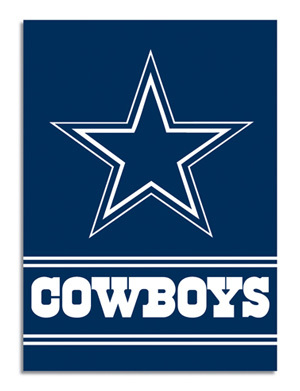 Officially licensed Dallas Cowboys 20" x 30" NFL Welcome Mat made of 100% non-woven polyester with a skid resistant foam urethane backing. 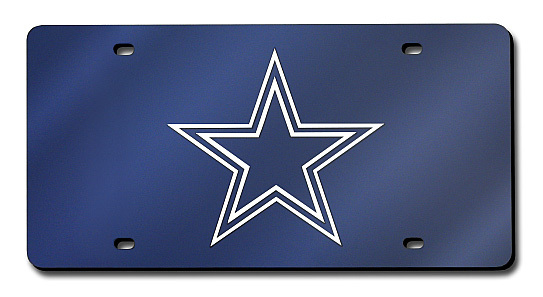 The Dallas Cowboys Welcome Mat is also mildew and stain resistant, UV stable and machine washable. Made in USA. 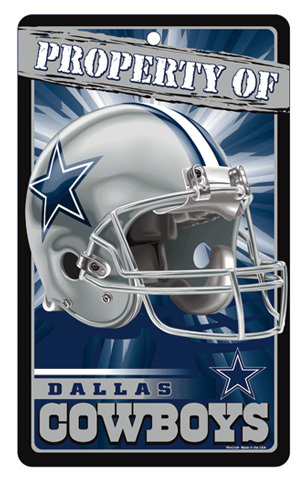 Officially licensed Dallas Cowboys NFL Football helmet mousepad with soft fabric surface, durable foam construction and slip resistant bottom. 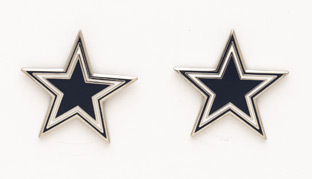 Measures 9" x 10"
Officially licensed NFL post earrings with Dallas Cowboys team logo in hard enamel modern cloisonne. 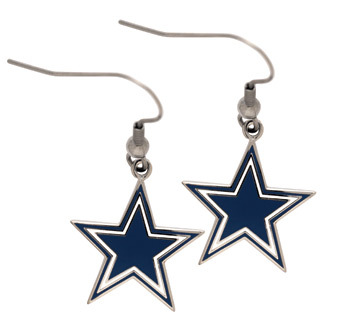 Officially licensed NFL wire earrings with Dallas Cowboys team logo in hard enamel modern cloisonne. 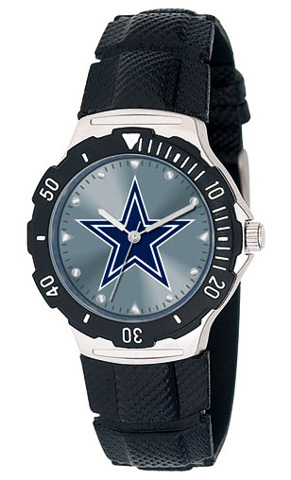 This officially licensed Dallas Cowboys NFL adult watch features: stainless steel case back, adjustable textured PVC band, water and shock resistant, quartz accuracy, rotating bezel, and Dallas Cowboys NFL team logo on the face. Limited lifetime warranty. 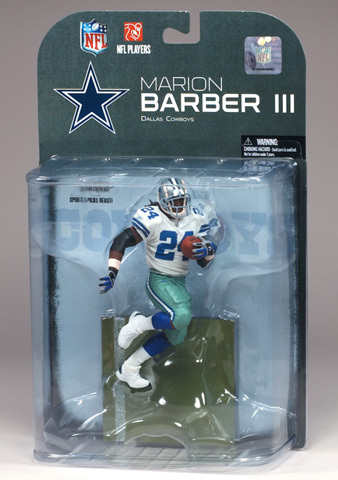 Marion Barber III - Dallas Cowboys NFL Action Figure, by McFarlane. 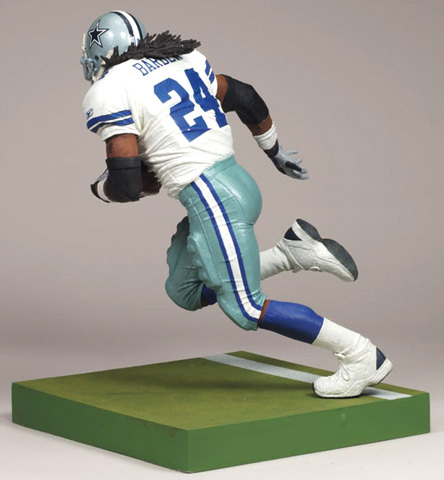 Officially licensed Marion Barber NFL action figure sculpted in meticulous detail and captured in mid-game action with authentic uniforms and equipment. Measures 5.75" in tall and includes a 3.5" x 3.75" custom base. 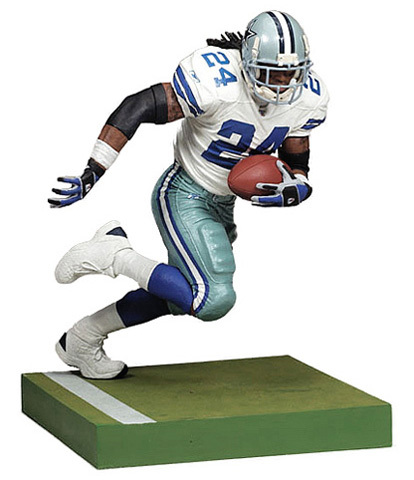 This is Marion Barber's NFL figure debut!